Unfortunately, the most common way someone finds out that they have a lost birth certificate, is they need it and cannot find it. Not having your birth certificate handy can delay getting a passport, getting a driver’s license, a job, or numerous other activities. If you’ve never been in the position of needing to replace your birth certificate before, you might think that you would need to go through the hospital of your birth. 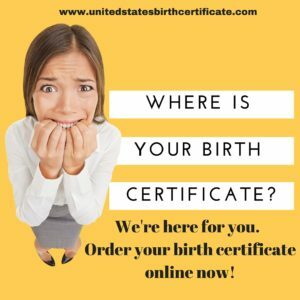 You can either go through the vital records department for your county of birth in your state or we can help you replace a lost birth certificate. Another precaution you can take if your birth certificate has been lost or stolen is to contact the credit bureaus: Experian, TransUnion and Equifax and ask to have a statement added to your personal credit report that asks for any creditor opening an account verify the identity of the person applying for credit. Need to replace a lost birth certificate? Use our online order form and make it fast and easy to get it done.